Typically, when two teams of Cleveland’s and San Antonio’s caliber meet, fans can rest assured they are about to see a great game. But in recent weeks, neither the Cavaliers or Spurs have looked like contenders. Tuesday’s game between them didn’t generate as much buzz as it might have in the past. But winning it was still very important to both teams. It was a chance for the winning team to break out of the rut they’ve been in. At first, it looked like Cleveland might get things turned around. LeBron James scored eight in the first quarter and got the Cavs out to an early 29-25 lead after. He became the youngest player to score 30,000 career points when he hit a 19-foot jumper with one second left in the opening quarter. But in the second, it was all San Antonio as Cleveland’s defensive issues crept back up. The Cavs were able to hold onto the lead until the last couple minutes of the quarter. That was when Tony Parker led the Spurs on a 9-2 run to close out the half. The burst gave San Antonio the lead, 63-55. Cleveland fell behind by as much as 14 in the third quarter. But they also closed the gap to just five points as well. 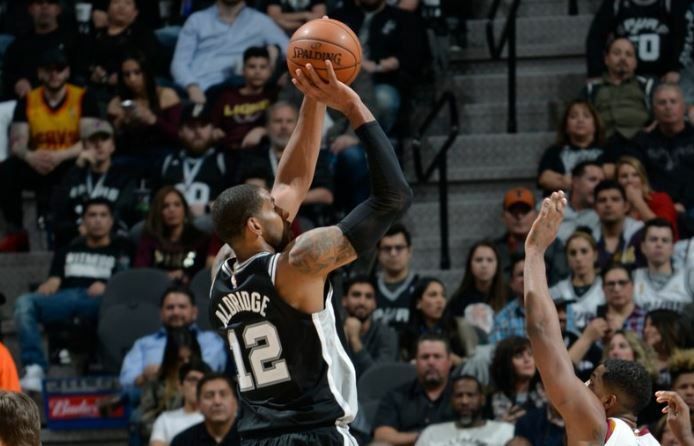 But thanks to a Patty Mills three-pointer with seven seconds left, they were still down by eight entering the fourth quarter, 89-81. The Cavs got within four early in the final quarter but were unable to get any closer. A 21-foot jump shot by Derek Rose with 42 seconds to play closed out the scoring, 114-102. San Antonio has been struggling to find someone to lead the offensive charge the last couple games. But they did not have any issues this time. LaMarcus Aldridge led the way for the Spurs with 30 points (12-18 from the floor) followed by Dejounte Murray with 19. Murray, who made his second start since taking over for Tony Parker, also had ten rebounds, three assists, and seven steals. Cleveland’s team meeting appeared to only succeed in airing dirty laundry. The product on the court looked much like it has in recent weeks—hence, the same outcome. Fans had hoped for a better outcome since San Antonio was without Pau Gasol, Kawhi Leonard, Manu Ginobili, and Rudy Gay. Cleveland will have a couple of days off to try to figure something out. They don’t play again until Friday when the Pacers come to town. San Antonio will be back in action Wednesday night against the Grizzlies in Memphis.